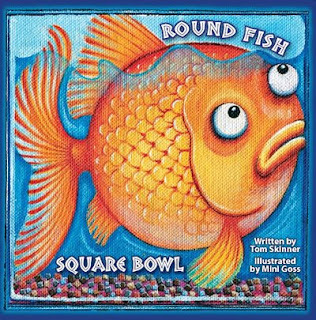 Round Fish Square Bowl is a picture book that celebrates individual differences. If you have a child who walks to the beat of a different drum, this could be just the picture book for him. Written by Tom Skinner, and illustrated by Mini Goss, it's a New Frontier (2007) book. It starts off, "Have you ever felt as if you don't quite fit in? A bit like a square peg in a round hole? Or a fish out of water, gasping for air?" I believe our society needs square pegs just as much as we need round pegs, old pegs, new pegs, pegs with two prongs or pegs with three. I love the fact that this picture book underscores that need, and does its best to help all little pegs be proud of their individuality. The book works on different levels. It's not a narrative, more a wry commentary on not taking stereotypes for granted. It does this in a light-hearted, positive way. Round Fish Square Bowl is also an exploration of language, encouraging young readers to think about expressions like "as stubborn as a mule" or "as poor as a church mouse". In the second half of the book, Tom Skinner stands those cliches on their heads, and introduces situations where the opposite is true. A mule's stubbornness can be used to save lives, a tortoise can beat the flashy hare with his own brand of steady determination. Characters from fairy tales, fables and stories demonstrate the truth of the idea that being different can be a great success. My favourite page is the one where the poor church mouse actually turns out to be rich with family and friends, despite his shabby arm chair being patched and propped up with a tin can. Mini Goss adds yet another layer to the story with her illustrations. They're very 'tactile', with the canvas of the original paintings being a feature. There's plenty of detail to make the visual text something for kids to ponder and giggle about, but the pictures are also large and clear - perfect for a group read-aloud. Key words are written in a special font, underscoring their meaning, and helping beginning readers. As a follow up to sharing the story, it would be fun to try to track down the origins of some of the expressions, and of the characters. Some will lead to well-known tales like The Three Little Pigs, or The Hare and the Tortoise. But children might not be as familiar with Alice in Wonderland's Mad Hatter, so use the book as a springboard to other stories. Have your children ever felt as if they don't fit in? What qualities make them different, and special? They could construct their own little book by using photographs of themselves doing the things that make them proud to be different. I have some suggestions for making digital stories or posters in earlier posts. This is the first New Frontier book I've reviewed. I am very impressed with their website. It has fabulous, curriculum-related resources available for their books, perfect for homeschoolers, teachers, or anyone looking for educational activities linked to literature. Just go to New Frontier Resources page, and choose your book. There are stacks of excellent literacy activities available there for Round Fish Square Bowl, really adding value to an already valuable book.